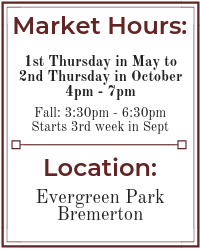 We Are Now Bremerton Community Farmers Market! Our new name reflects how much we’ve grown, thanks to your support! With the addition of “community” to our name, we are now officially the Bremerton Community Farmers Market. We hope this will reflect just how deeply rooted and committed we are to supporting local right here in OUR community. For the last 12+ years our market has been bringing people together around locally produced foods, art, music, and health & wellness. We are proud our market has become a signature institution in Bremerton and want to honor the wide base of diverse community members supporting it. We are excited about the evolution of our market and hope you are too. 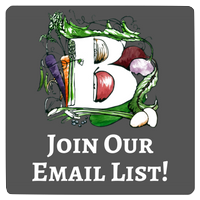 We invite you to share with others why you support the Bremerton Community Farmers Market and hope to see you at opening day on May 2nd, 2019! Oct. 11th – LAST MARKET OF THE SEASON! Calling all Local Food Minded Artists!